Lebensraum: the entitlement of “legitimate” Germans to living space. Entfernung: the expulsion of “undesirables” to create empty space for German resettlement. During his thirteen years leading Germany, Hitler developed and made use of a number of powerful geostrategical concepts such as these in order to justify his imperialist expansion, exploitation, and genocide. As his twisted manifestation of spatial theory grew in Nazi ideology, it created a new and violent relationship between people and space in Germany and beyond. With Hitler’s Geographies, editors Paolo Giaccaria and Claudio Minca examine the variety of ways in which spatial theory evolved and was translated into real-world action under the Third Reich. They have gathered an outstanding collection by leading scholars, presenting key concepts and figures as well exploring the undeniable link between biopolitical power and spatial expansion and exclusion. "In its search for the spatial-geographical foundations of a years-long, highly influential, regionally based project (Nazism), Hitler's Geographies demonstrates the value of looking broadly and deeply at the geographical ideas and assumptions undergirding world-changing developments in particular times and places. The results of such efforts could be of enormous benefit to historical and geographical understanding alike." 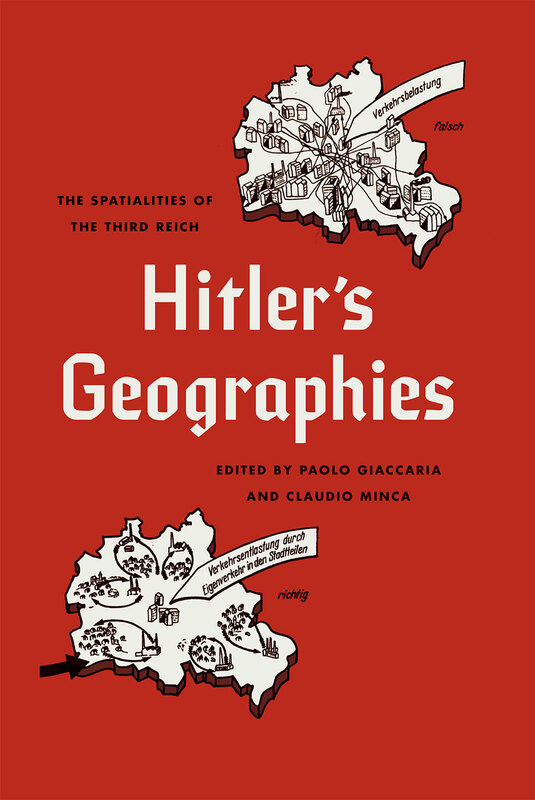 "Hitler's Geographies offers a[n]... ambitious project: a preliminary attempt 'to start formulating a tentative spatial theory of the Third Reich' through a collection of essays that 'directly engag[e] with the specific relationship between spatial theory, Nazi ideology and its geopolitical and genocidal practices" (2-3)... It is a useful contribution to the field that whets the appetite for a more thorough and comprehensive effort to develop a spatial theory of the Third Reich." "Hitler’s Geographies: The Spatialities of the Third Reich is a well planned, meticulously executed work that examines the Nazi mapping enterprise through a new level of interdisciplinary rigor."